NumisMedia Monthly - July 2012 - Do Silver Commemoratives have a Future? Do Silver Commemoratives have a Future? �����With the summer months now upon us, most dealers feel the coin market will be a bit lackluster, at least until the ANA in Philadelphia. Many are concentrating on vacations, the upcoming elections, and the economy, not necessarily in that order. 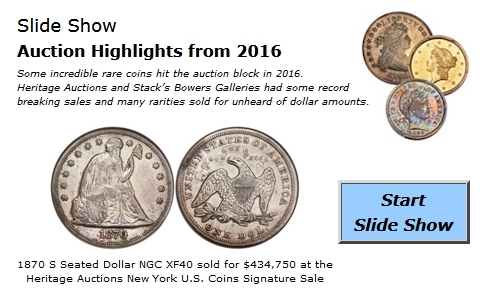 Those collectors and investors who trade coins on a regular basis seem to be doing a lot of bargain hunting of late. Predicting which series are ready for upward movement in the future is what separates the successful dealers from the rest. Longtime numismatists know that most series rise and fall in cycles. Some cycles last longer than others; this is the case for Silver Commemoratives. 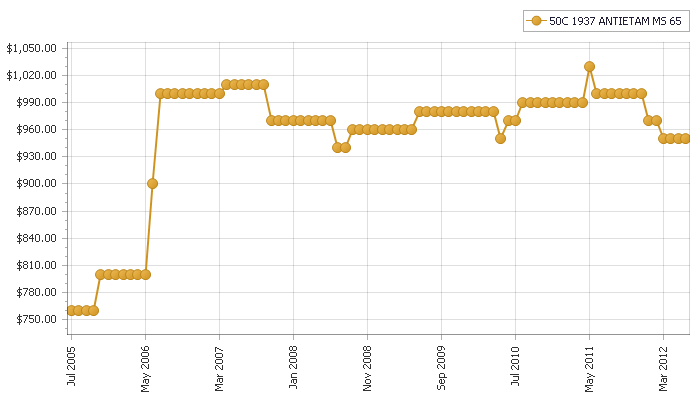 �����The following graph shows the FMV for the 1937 Antietam Silver Commemorative over the last few years. However, not all Commemoratives have fared as well. �����Since the early 1970�s we have monitored various cycles for Silver Commemoratives. Much of the time it was easy to tell when they were ready for an upturn because dealers would start buying them to put away. For the most part, prices were at a lull and lethargy was the norm. Silver Commemoratives have been drifting lower and lower since 2007. There does not appear to be any support for the entire series although there are buyers for some specific dates and grades at current levels. While we do not know when prices will stabilize, there are plenty of buyers out there taking advantage of the extensive discounting at today�s prices. What would be very discouraging is if these treasures of events gone by were not selling at all. As we monitor dealer sales and auctions, it is obvious that prices are all over the board. This is a series where the phrase �beauty is in the eye of the beholder� is most appropriate. �����The following chart shows the total FMV for the complete 144 coin set of Silver Commemoratives by grades from July 2007 to July 2012. This includes all the PDS coins from the various original sets. We listed the grades of MS63 through MS66 as the best examples of coins that trade most often. �����The FMV for the MS63 grade, being the most stable, has declined only 7%. For most of these coins the MS63 grade represents the base grade for Mint State; it is what the typical coin grades since many of the coins were never meant to circulate in the first place. The FMV for the MS64 grade lost nearly 14% while the prices for the MS65 grade deteriorated almost 23%. These grades are the most heavily certified so availability may be an important factor. The total FMV for the MS66 grade fell $43,962 or 19%. �����While the total results look rather pitiful there are some issues that did much better than the set as a whole. The Gettysburg in MS66 began at $990 in July 2007 and now has an FMV of $970. The 1936 S Oregon in MS66 is unchanged at $500 FMV although it had increased and decreased along the way. The MS64 Grant with Star surprised us with an increase from $2,810 to today�s $2,910. Nevertheless, the trend has definitely been down for several years. In fact, if we go back even further the Bay Bridge was $650 FMV in July 2006 compared to the current FMV of $456. That is a drop of almost 30%. Nearly the entire series has similar results which can be studied individually. �����Silver Commemoratives have such a great story to tell, each representing an important event in American history. Everyone enjoys collecting pieces of history, just look at the tremendous positive atmosphere around Carson City minted coins. Is this a good time to buy Silver Commems or will prices continue to be stagnant or drop even further? What will it take to heat up the Commemorative Market?